Meet Raa Raa who comes from the hit show on on Cebeebies, Raa Raa the Noisy Little Lion. Raa Raa lives in the jungle with his friends where he enjoys many adventures He helps children to find the confidence to communicate by using rhythm, rhyme, repetition and retelling. He's a lovable little fella even though he's very noisy. We watch Raa Raa every day but we sing "Raa Raa, You are, The noisy little Ryan" Ryan being my son of course, he loves this show. It's always full of fun and exciting stories. It's brightly coloured and contains lots of great music. Ryan is a huge fan and If I'm honest I quite enjoy it too. This interactive roaring Raa Raa toy is a whole lot of lion fun! You simply press down gently on his head to hear him let out a huge ROAAAAARRRRRRRR! Ryan loves his roar and thanks to Raa Raa he's now found his own almighty Roar or squeal in Ryan's case. 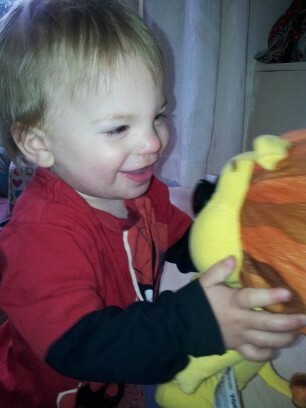 It does make me smile, every time Raa Raa roars so does Ryan. Bless him, he really loves his new friend. We still watch Raa Raa every day but the only difference is, Raa Raa watches it with us now. Roaring Raa Raa is made by TOMY and retails at around £29.99 and is available from stockists including ToysRUs, Amazon and Smyths. We give Roaring Raa Raa a fantastic 5/5 because he really is so much fun. He's really brought out the inner voice in my Ryan and and he just adores him. We received our Roaring Raa Raa for free for the purpose of this review but all the opinions are my own and are not influenced by this. Ryan really does love Raa Raa.